This entry was posted in Abortion, Encouragement, News and tagged Abortion, Apologetics, Bible, Christianity, church, God, Gospel, infanticide, Jesus, murder, Planned Parenthood, Politics, Pro-Abortion, Pro-Choice, Pro-Life, proabortion, prochoice, Prolife, Religion, Theology. Bookmark the permalink. They will ‘explain this away’ with human reasoning, just like they do everything else; as Todd already pointed out, suppressing truth is what man does best. Great point, Pilgrim. And Todd nailed it. Natural man hates God, even if he denies God. Such a man is a fool and, as with us before He raised us from spiritual death, there is no hope for such a man unless the Lord opens his eyes. I saw this a few times last week on Facebook. This is a very powerful statement. Pilgrim, I appreciate the humor and logic in this post. But the argument from most anti-life camps is not one based on whether it is life that is in the mother’s womb, but whether if/when it is a person and has the qualifications and the rights of person-hood. That has seem to be the argument I hear these days. That’s your problem Pilgrim, your using logic. The other side uses emotion, adhominem attacks and the “you’re not a woman, so you can’t talk” argument. 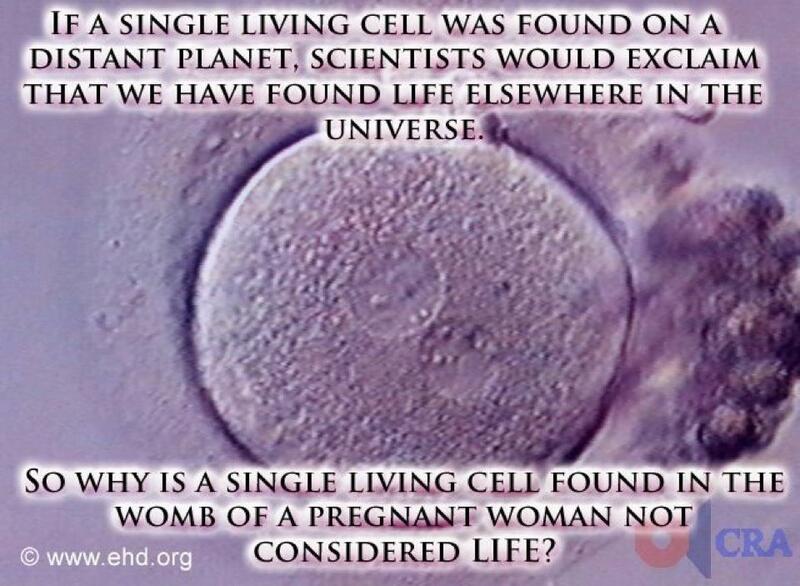 I see your point Jordan…then simply ask, “If killing that cell would end all life on said planet, would it be okay to do so knowing that that cell might evolve into a human like race?” Think of inconveniences that cell would bring about.